Lisbon is the capital and the largest city of Portugal. Lying on the banks of the Tagus estuary and bordering the Atlantic Ocean, Lisbon boasts an incredibly rich history, and a plethora of atmospheric neighbourhoods, grand monuments, picturesque lanes and broad boulevards. My recent visit reminded me yet again why it’s one of my favourite European capitals! 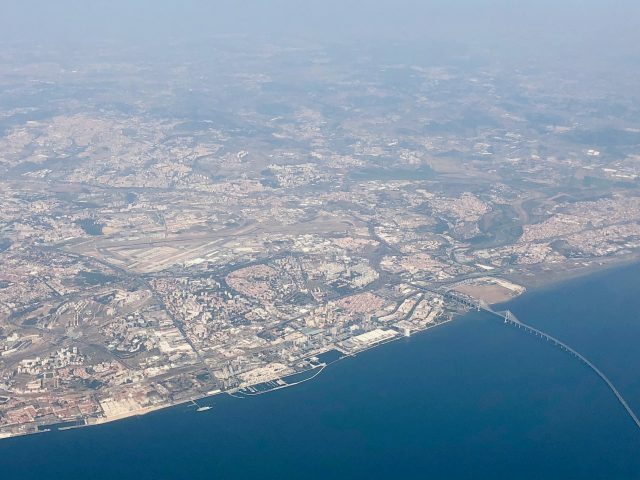 Both landing in and taking-off from Lisbon was a treat as I had panoramic views of Lisbon from the plane window! I sat in row ‘A’ on both flights. The plane landed from a southwesterly direction and on my way home, took off in a southwesterly direction. The plane approached Lisbon from the north, flew past the city and over the Atlantic Ocean before turning around to make the final approach. As the plane approached Lisbon from the Atlantic Ocean, it flew over the beaches of Costa da Caparica. The little tower on the banks of the Tagus (centre of the photo) is the historic 16th century Torre de Belem, a UNESCO World Heritage site. The ‘tower’ in the far right of the photo is another famous Lisbon landmark: the Padrão dos Descobrimentos. Just before landing, another famous Lisbon landmark came into the view: the 18th century Aguas Livres Aqueduct. The airport is located approximately 6 kilometers from the city center so the panoramic views of Lisbon unfolded rapidly right after take off! The view unfolded quickly right after take-off! The grand Avenida da Liberdade leads right into the historic city centre. The big cluster of buildings in the centre is the Bairro Alto district, with its maze of picturesque streets. The plane flew over the Atlantic Ocean before turning back towards Lisbon in a northeasterly direction. The 25th April Bridge (similar to the Golden Gate Bridge in San Francisco) can clearly be seen. Just before the plane climbed above the clouds, I caught a view of Lisbon Airport (center-left) and the 17km long Vasco da Gama Bridge that crosses the Tagus. 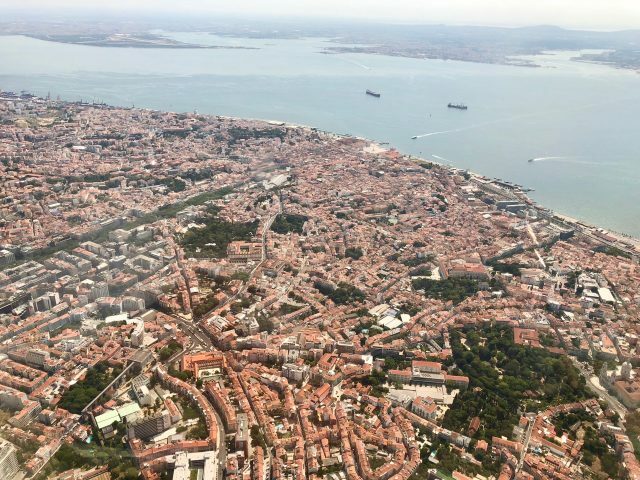 If you’re flying into or out of Lisbon, choose a window seat for some pretty spectacular views of the city! Thanks for your comment Michelle! You sure need good walking shoes for Lisbon! Lisbon is one of our favorite European cities, especially now that we know to bring good walking shoes! Also amazing to visit is Macao (a ferry ride from Hong Kong), which was a Portuguese colony until 1999, when it was returned to China. It’s a crazy-wonderful mix of Portuguese (especially the tiles) and Chinese cultures, with a splash of Las Vegas thrown in. Really amazing.